Choose between the two-channel, four-pad stimulator unit or four-channel, eight-pad stimulator units. 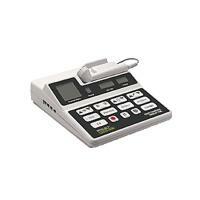 Offers the convenience of a full-featured stimulator and ultrasound in one unit. Ultrasound includes 1 and 3.3 MHz frequencies, 10%, 20%, 50% and continuous-duty cycle selections with head warming. Includes Nylatex® wraps, 5 cm² soundhead, both red and black 3" round electrodes, lead wires and 9 oz. bottle conductor gel as standard equipment. Input jack for combination therapy. TENS/EMS Units & Stimulators can be found in our extensive online collection of products from globally recognized and trusted brands, including Chattanooga. An excellent option to consider is the Intelect Legend Stimulator/Ultrasound Combination Unit.